Raising TCKs can be fun and adventurous. Heck raising kids can be fun and adventurous. With all the fun and adventure though, I get tired and a bit weary. I’m feeling that today. The weather is NOT helping either. You know those very simple things in life that just bring a smile to your face? A specific candle scent. 5 minutes with a magazine or ezine. 5 minutes of uninterrupted time of quiet. Coffee with a sprinkle of cinnamon. My trick is to put the cinnamon in with the coffee grounds. My body begins to relax just from smelling the coffee brew. And the taste? Well, a little taste of wonderful. 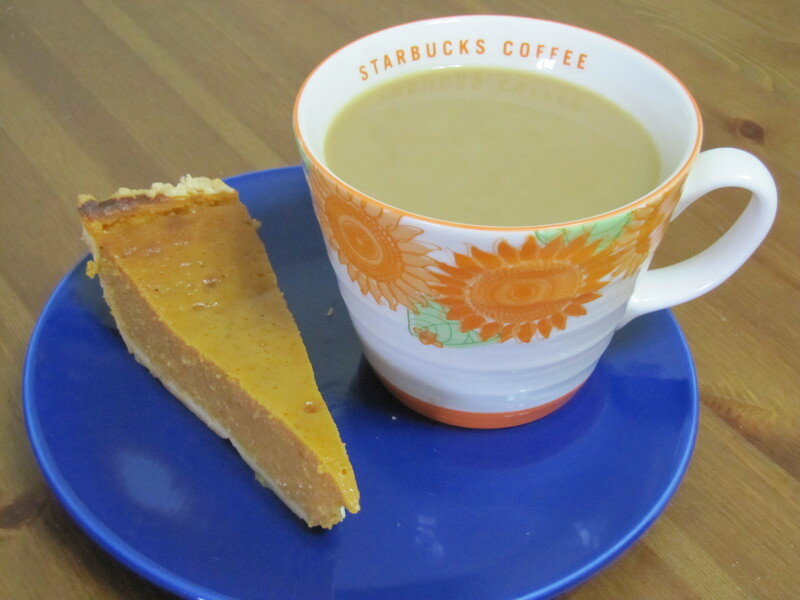 And today I’m having that with a piece of pumpkin pie. Pie that I didn’t even bake. It was from a friend who gave it to us. Just another simple pleasure. What is your simple pleasure? How do you survive those dreary days? Comment below. This entry was posted in Parenting and tagged coffee, parenting, simple pleasures, tcks by MaDonna. Bookmark the permalink. My simple pleasure can be baking a Dutch apple pie on a rainy day and then eating it warm just after it comes out of the oven (adding a scoop of ice cream is really lovely too). I can really enjoy reading a book. I am now reading “Sunshine Soup” by Jo Parfitt, a book that nourishes the global soul. Sounds good doesn’t it? You are making my mouth water!!!! I love my mother-in-laws Apple Cake. You have reminded me of that. I just wish I could make it like she does. That does sound like a good book. I’m going to check it out on Amazon.